More than 6,000 branches of the Post Office are to be revamped by the government in the next three years. An investment programme costing £1.34bn will modernise the sub-branches, which will then be styled as either main or local branches. The local branches will typically be those in convenience stores. The Post Office said this will mean longer opening hours and modern fittings for customers at the revamped branches. The remaining 5,500 sub-branches will stay as they are. Of the new modernised branches, 4,000 will be designated as main and 2,000 as local. A pilot programme for the conversions, covering 227 converted sub- branches, is already underway. The conversion programme will not affect the 373 big city-centre branches known as Crown branches. 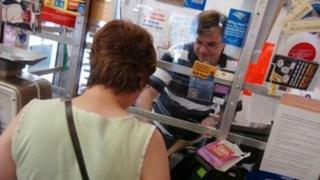 The government repeated its pledge that there would be no further closures of post office branches. The Post Office pointed out that the number of people using its branches has fallen by nearly a third in the past decade, down from 28 million customers a week in 2000 to 20 million now. Paula Vennells, chief executive of the Post Office, said: "This is a once-in-a-generation opportunity for the Post Office - a chance to revitalise the network and allow it to meet the needs of twenty-first century customers and communities." "This major investment will help Post Office Ltd address changing customer needs by revitalising the network, with extended opening hours and a better experience for our customers." The postal affairs minister, Norman Lamb, said: "This government has made a commitment that there will be no closure programme and invested £1.34bn to secure the long term future of the Post Office. "However, change is needed to secure the long term future of post offices; the pilots are showing the new 'locals' and 'mains' models are popular with consumers and sub-postmasters." Including Crown branches there are now 11,800 post office branches in the UK. Their number has fallen sharply from its peak in 1963 of 25,000. The closure programme was particularly vigorous in the past decade with 6,600 closing since the year 2000. The modernisation programme will be voluntary and it will be up to individual sub-postmasters to decide what to do. Those who opt to become a main branch will see up to £45,000 spent on their premises, depending on the size of the branch. Those who chose to become a local branch will receive investment of up to £10,000. Sub-postmasters who do not want to see their premises converted, and who do not want to stay as they are, will be able to leave the business with compensation of 18 months' earnings. George Thomson, general secretary of the National Federation of Sub-postmasters, said: "This investment will bring significant benefits to customers, communities and local businesses right across the UK. "It provides a great opportunity for thousands of sub-postmasters to modernise their post offices creating an improved, more sustainable network." The Communication Workers Union (CWU) took a dim view of the plan, saying the funding had first been announced two years ago and was not new money. "There are serious flaws with the downgraded 'locals' model which deny services to customers - not even the ability to post parcels in many cases - while only making them available at tills in convenience stores and petrol stations," said the CWU's general secretary Billy Hayes.